Freeze-for-freeze is the right approach. It’s time to hammer out the details. About a decade ago, I was working at the Straits Times as a defense and security columnist, and like many of my ilk, I milked developments about North Korea’s missile and nuclear arsenal for all it was worth. True to form, many of my op-eds took digs at Kim Jong-il’s lack of rationality and how he was “so ronery.” (A phrase from Team America! World Police a B-grade flick which parodied Kim as a childish despot). In 2012, North Korea invited foreign media to witness what it termed the historic launch of a space vehicle (seen by skeptics then as a cover for its development of ballistic missiles). I asked the North Korean ambassador to Singapore if I could be invited to the event. I received a pleasant surprise when his aide asked me to visit the envoy’s residence. On that day, I told my colleagues that they should look for me if I did not make it into the office after. Apart from a DPRK flag in its front yard, the ambassador’s suburban terrace house in Singapore’s Joo Chiat district did not look very much different from the other houses in the neighborhood. Inside, the grayish interior had cupboards and tables lined with coffee table books about Kim Jong-il and Kim Il-sung. Exchanging the usual pleasantries, the envoy said he had read all my op-eds about North Korea (at that point I half-expected some thugs to storm out from the kitchen to accost me) and how he would really like to get to know me better. He said he would try to get me an entry visa to witness the launch of the space vehicle. In the end, it turned out that my request for a visa had gone in too late. Since 2012, however, North Korea has come a long way in its quest to become a nuclear-armed power with the ability to strike the United States with an intercontinental ballistic missile. 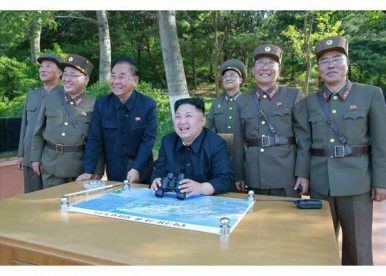 While the media has had a field day lampooning Kim Jong-un’s lack of rationality, North Korea’s missile and nuclear development shows a cool-headed rationality in building up the country’s nuclear deterrent. In 1993, DPRK was reported to have enough weapons-grade plutonium for one or two nuclear weapons. Today, North Korea is said to have enough material for about 4-7 nuclear weapons. In 1998, North Korea fired a Taepodong-1 rocket over Japan as part of a failed satellite launch. Nearly 20 years later, it flight tested the Hwasong-14 in July this year, which flew 930km. A U.S. government source with knowledge of the launch confirmed that the missile’s range could fall in the 7,500-9,500 km range, putting major cities on the U.S. west coast in range. On August 29, Pyongyang fired a ballistic missile over Japan that flew 2,700 km and landed in the northern Pacific Ocean. No doubt, THAAD brings something different to the table, given that it is a clear expression of deterrence by denial, seeking to dissuade North Korea from pursuing aggression. All told, however, THAAD remains a technical fix for a long-standing problem: North Korea’s quest for security and the resultant need for a nuclear deterrent. Compared to 1994, the stakes now are far higher: North Korea is farther down the road as a nuclear-armed power, and as it progresses down this road, the chances of deterrence failure would increase. What then? Before we explore what is possible, one has to examine the options which have not worked or are infeasible. In 1994, the U.S. readied a detailed plan to attack North Korea’s Yongbyon facility with precision-guided bombs, after North Korea ejected inspectors at the nuclear reactor and commenced steps to extract weapons-grade plutonium. But the plan was rejected in light of the potential casualties. The Trump administration has stressed that “all options are on the table” — including military action — stressing that the Obama-era policy of strategic patience was over. While military options on North Korea are theoretically plausible, they are practically impossible in light of the costs involved. If attacked, the use of nuclear weapons by North Korea is at the highest rung of the escalation ladder. Plausible options for Pyongyang to use in retaliation are its conventional artillery, 3,500 main battle tanks or its well-trained special operations forces. South Korea estimates that the North has about 8,600 pieces of tube artillery and 5,500 multiple launch rocket systems (MLRS) in forward positions — assets that would threaten the greater Seoul metropolitan area. As for sanctions, North Korea was already under a stern sanctions regime prior to its September 2016 nuclear test, with United Nations Security Council Resolution 2270 (UNSCR 2270) in place. Eighty days after the September 2016 test, UNSCR 2321 slapped on more sanctions. Non-proliferation efforts represent the most laudable attempts at reining in North Korea’s weapons development. A promising breakthrough occurred in 2005, with the signing of a joint statement in which North Korea agreed to abandon its nuclear weapons program in exchange for aid, a U.S. security guarantee and normalization talks with Washington. But the problem with non-proliferation attempts is a two-party one: while North Korea has been lambasted — rather correctly — for reneging on past agreements, the U.S. can also be blamed. One historical analysis shows that deadlocks in U.S.-DPRK dialogue were mostly caused by U.S. failure to deliver on its commitments, as well as an uncompromising U.S. negotiating strategy. Given the past history with sanctions, thinking about military strikes and non-proliferation, the U.S. and its allies are in uncharted territory. Worse still, falling back on the “contain and deter” strategy will not work. In the madcap movie Dr. Strangelove, the eponymous character states that deterrence is the “art of the producing in the mind of the enemy the fear to attack.” That’s the theory, at the least. In practice, I prefer to go with the fictitious Sir Humphrey Appleby in the classic British sitcom Yes, Prime Minister, when he argued that the Russians might not know for sure whether the U.K. would attack it with nukes: “Even though they probably certainly know that you probably wouldn’t, they don’t certainly know that, although you probably wouldn’t, there’s no probability that you certainly would.” Or as Jeffrey Lewis puts it, there is no certainty that America’s luck will hold in deterring Pyongyang. A potential solution to the North Korea impasse would be a re-examination of China’s suspension-for-suspension, or freeze-for-freeze proposal, whereby North Korea would suspend its nuclear and missile testing in exchange for a suspension in military exercises by American and South Korean forces. Such a solution would have to be cognizant of two current realities. First, short of an explicit American security guarantee, North Korea has deemed nuclear weapons to be strategic insurance for the survival of the regime and the country. Second, any workable solution would have to be less ambitious, yet plausible enough, as to put all concerned parties on the road to achieving the long-term goal of denuclearisation. The first phase of a double-freeze could incorporate another element — a ban on nuclear technology exports by North Korea, as well as a freeze on long-range missiles short of an ICBM and nuclear activities at Yongbyon, in addition to the return of nuclear inspectors. Another proposal would be for the U.S. and South Korea to continue smaller, unit-by-unit training without scaling back their frequency or intensity. If the freeze-for-freeze holds for say, 12 months, more extensive talks for Phase Two could begin. This would cover talks on economic development, trade development and financial integration. The U.S. could propose four-power talks between China, North Korea, South Korea; Washington could also propose the beginning of talks to negotiate a peace treaty, and move towards the normalization of U.S.-North Korean relations. The third and last phase would address denuclearization of the Korean peninsula. A freeze-for-freeze model would be fraught with difficulties, given the history of North Korean intransigence on previous agreements. As Robert Gates, the former U.S. secretary of defense, said in 2009, Americans are “tired of buying the same horse twice” vis-a-vis North Korea. Trump, for all his mercurial and unorthodox approaches to policy, might be convinced of a freeze-on-freeze as a possible — albeit longer — route to denuclearization. Trump has indicated that he would be willing to initiate talks with Kim Jong-un. He is learning that the Chinese, for all their connections to the North Korean regime, cannot be pushed to effect additional sanctions on Pyongyang. In May 2017, U.S. Secretary of State Rex Tillerson indicated that Washington harbored no “hostile intention” towards Pyongyang and was not considering regime change or an invasion. The building blocks are in place — a viable model for freeze-on-freeze, support from China and South Korea and a U.S. president who is not dogmatically opposed to new thinking on old problems. North Korea is said to be the “land of bad options.” In the current circumstances, however, a dialogue about a freeze-for-freeze could present an entry into long-term talks about disarmament — the least bad option in putting North Korea back on the road to denuclearization. Think of the latest missile launch over Japan as much as an act of aggression as a cry for dialogue.